Dressing up in formal Marine wear is serious business. Your shoes better be so shiny that you can see yourself in the leather. Make sure your pants are pressed and all your buttons are buttoned. 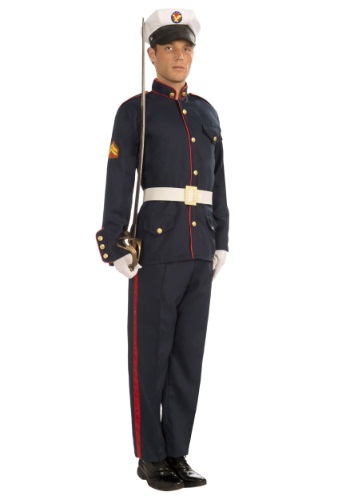 After everything is set straight, you'll have the powerful air the uniform is designed to give you. If you were going to a military ball you'd blend right in. When you are marching in your formal blues, military officials just might give you the go ahead to skip boot camp and step into the Pentagon. Why go to boot camp when you've obviously already gotten top marks in charm school? You never know who might be watching as you raise the flag or march around your front yard. Sure, your neighbors might think you've lost it but you never know, there just might be a Marine recruiter sitting in that utility van across the street. When you've been recruited and streamlined to the top ranks you'll have the influence on the country you've always deserved. It's amazing what dressing to impress can do! You know what they say about a man in uniform. You'll find that looking sharp has never been so easy. Whether you're wearing the suit to impress your in laws or for a costume party, your new look is sure to leave an impression. Just get ready because people are going to expect great things from a man who looks as important as you do in your formal blues. You're one of the few and the proud now. So, look alive, soldier!